Let us start off with a quick history lesson. The first SIM card that was produced, back in 1991, was actually the size of a credit card. But over the years the size of the SIM card has remarkably reduced until we thought nano (4FF) would be the end. Well, we were wrong and along came the embedded SIM, technically know as MFF2 (btw, don’t confuse embedded SIM with eSIM). This is a SIM that is soldered in the device at the time of manufacturing, it cannot be replaced or removed unless you want to seriously damage the device. Definitely, this type of embedded SIM is useful from a device design perspective, but the first question that comes to mind is how am I supposed to change my subscription from one carrier to another? This simple question marked the end of the nearly 25-year reign of the traditional SIM. In all its sizes from regular (1FF), mini (2FF), micro (3FF), nano(4FF) and embedded (MFF2) the SIM progressed without any revolutionary developments, until the world welcomed eSIM. Yes, eSIM, technically know as eUICC, is the answer to your question. This technological wonder allows the user to change the carrier subscription remotely without physically replacing the SIM. It does sound magical but there is a whole new infrastructure in place and sophisticated servers/platforms to facilitate this technology. Now that we have your attention, we would like to describe how this subscription change actually happens. With the introduction of eSIM, The GSMA (The GSM Association is a trade body that represents the interests of mobile network operators worldwide, and standardizes all telecom related products) introduced two new servers that need to be placed within a carrier network. First is the Subscription Manager Data Preparation server, commonly referred to as the SM-DP and the second is the Subscription Manager Secure Routing server, referred to as the SM-SR. These servers work in tandem behind the scenes to simplify the subscription changes on the eSIM. Simply put, the SM-DP is the database, or warehouse, where you store all the different carrier subscriptions that can be downloaded onto the eSIM including the network authentication keys, IMSIs (the unique identification number of a subscriber), and all subscription related data from carrier A, carrier B, etc. On the other hand, the SM-SR ensures that all information passing from the SM-DP to the eSIM card, and vice versa, is fully secured and cannot be intercepted by any hackers. The combination of both servers allows the end user of the eSIM card to securely download new subscriptions (new carrier deals/profiles), activate the downloaded subscriptions, delete the unused subscriptions, or simply swap between two downloaded subscriptions. Now imagine that a device is currently connected with Carrier A, and you want to connect to Carrier B. 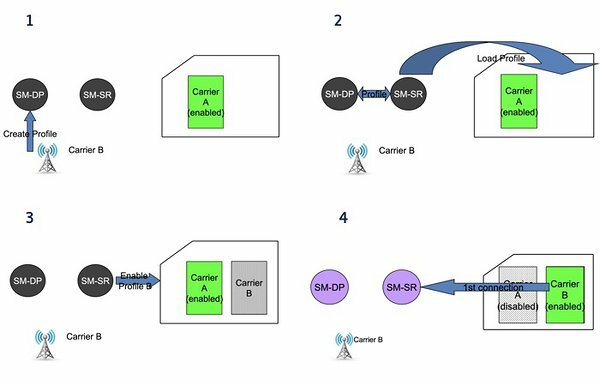 The first step would be for the SM-DP to make Carrier B’s subscription available for download, once available it would be downloaded on the eSIM via the SM-SR. After downloading, the user will request for the SM-SR to activate Carrier B’s subscription. The SM-SR will then send a command to the eSIM for activation. After the activation command is successful the device would connect to Carrier B and the Carrier A subscription would automatically be deactivated. Does it still sound like magic? This process can be repeated and a user can jump from one carrier to another through, as we like to say, the simple push of a button. As the market needs and use-cases of consumers, i.e. smartphones, watches, laptops etc., is very different from IoT & M2M use cases, the GSMA has separated the consumer eSIM architecture from the M2M eSIM architecture, and my blog thus far has targeted the M2M market. However, the concept is essentially the same, apart from some minor functional and architectural differences. Therefore the consumer devices case is another topic for another day. 1oT is constantly striving to educate its keen followers about eSIM, and would welcome suggestions on what you want us to write next. Feel free to reach out to terminal@1oT.mobi and we’ll make sure our eSIM experts will help you clarify any confusion and help launch eSIM for your next innovative IoT project.